Reviews and information of the best Solar panels and inverters from SMA, Fronius, SunPower, SolaX, Q Cells, Trina, Jinko, Selectronic, Tesla Powerwall, ABB. Plus hybrid inverters, battery sizing, Lithium-ion and lead-acid batteries, off-grid and on-grid power systems. UPDATE 2 - July 2016 - Powerwall 1 specification changes. UPDATE 3 - Aug 2016 - Powerwall 1 warranty and LG chem spec update. Cost per kWh comparison now includes battery efficiency. UPDATE 4 - Oct 2016 - New LG chem RESU, new pricing and warranty. UPDATE 5 - Nov 2016 - Tesla Powerwall 2 announced, double capacity. UPDATE 9 - June 2018 - Added battery capacity loss over lifetime. Updated battery efficiency specs including inverter losses. UPDATE 10 - Nov 2018 - Price adjustments - LG chem price drop & Tesla price increase. Added BYD B-box Pro battery system. Home battery systems combined with rooftop solar have being touted as an energy revolution, a game changer, or simply as a way for people who are sick of paying high electricity prices to lower their bills. In Australia there is a great incentive to store solar energy as the solar feed-in tariff has been reduced to as little as 5c per kWh, while the cost to purchase electricity is closer to 30c per kWh. This has become a driving force and great incentive to store solar energy rather than send it to the power grid for little return. Batteries for energy storage in buildings have been around for a long time in both stand-alone (off-grid) and commercial back-up (UPS) power systems, however over the last few years domestic energy storage in the form of hybrid solar systems have started to gain momentum, even with the relatively high cost of batteries. Another driving force for solar with battery storage is energy security. The increasing severe weather events due to climate change often cause prolonged power outages and a battery system can provide instant back-up power for your home or business. Residential battery storage systems also enable energy independence and provide a means to generate and store your own renewable energy. Home battery storage - Want to know which solar battery is best suited to your home? See our guide to Selecting and sizing a home solar hybrid system. Traditional hybrid and off-grid solar systems used deep cycle lead-acid batteries however over recent years lithium batteries have taken hold with many large companies such as LG and Samsung releasing lithium battery systems. Of course the biggest boost in interest came with the announcement of the Tesla Powerwall, this was when home storage batteries hit the mainstream. But will the Powerwall 2 be able to meet these high expectations, especially with growing competition from well established companies such as LG chem, BYD and Narada in China, BAE in Germany and the well established US manufacturer Simpliphi power? A direct comparison is not as easy as it sounds as each battery chemistry behaves differently under different conditions which can either prolong or decrease the life of the battery. To do an accurate comparison we lined up the Tesla Powerwall 2 with the LG Chem RESU lithium battery which considered the leading competitor to the Powerwall, plus the well known and widely used lithium iron phosphate (LiFePO4 or LFP) battery systems from US manufacturer Simpliphi Power, German manufacturer Sonnen and the large Chinese manufacturer’s BYD and Pylon Technologies. In this review the various lithium batteries are compared to the long life gel lead-acid based batteries from BAE and new lead-carbon battery released by Narada. There are also many new batteries technologies currently being developed but few are suitable for residential applications or have moved to the high-volume production level required to become price competitive. In this article we compare both new and traditional battery technologies using a number of criteria. A direct comparison is not as easy as it sounds as each battery chemistry behaves differently under different conditions which can either prolong or decrease the life of the battery. The primary aim is to determine each batteries storage capacity measured in kWh (kilowatt hour) over the cycle life of the battery, but we will also try to highlight the key advantages and disadvantages of the various types available. 1. The first key criteria is the upfront price per kWh, since upfront cost and payback time is one of the most important aspects for many consumers. Due to some battery chemistries having higher rates of degradation and lower efficiency, the real cost over time (payback) may be higher. This difference is highlighted in the conclusion. 2 - 3. 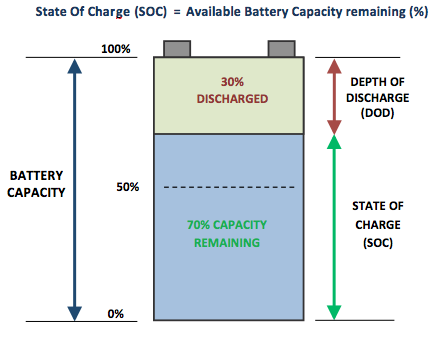 The second and third criteria really go hand in hand as battery life is almost always directly proportional to the depth of discharge (DOD). This means that the further a battery is discharged the shorter the battery life. The available energy or DOD on a daily cycle (charged and discharged every day) is usually specified by the manufacturer and the cycle life in years is based on this DOD value. However, the end of life (EOL) of a battery is not always clear as a battery doesn't just suddenly stop working after a certain number of cycles. Almost all battery technologies new and old slowly lose capacity over time and the industry standard for Lead-acid is to determine the EOL once battery capacity has dropped to 80%. However more recent lithium manufacturers such as LG and Tesla are warranting their batteries to lower EOL values of 60 or 70%. Remember the battery is still usable after this, it just doesn't hold as much energy. To complicate this further in real world conditions there are many variables including temperature, rate of discharge and incomplete charge (partial state of charge) so the performance and life of a battery system can be significantly altered. As a general guide lithium based batteries are designed to be discharged up to 90% total capacity while the traditional lead-acid (gel & AGM) batteries are generally not discharged lower than 50% unless in emergency backup situations. For those in the industry this is a relatively standard assumption. See our battery article for more specific information. 4. Following this we have the continuous and peak power output. This can be very important depending on the type of inverter you are using and the application, for example off-grid installations will usually require a higher peak power output as you do not have the grid available to assist in high load (high power draw) situations. 5. Next is round trip efficiency, this is the charging and discharging efficiency or losses during cycle use. Unfortunately, due to the laws of physics the transfer of energy from one form to another (in the case of batteries from electrical to chemical energy) will always result in some losses. Generally, charge/discharge losses from a lead-acid based battery is close to 20% while most new lithium based batteries can be as low as 2% but generally in the 5-8% range. 6. You may be surprised but I have put weight or energy density last. This is simply because I consider it rather irrelevant in a stationary situation, however if this comparison was for electric vehicles it would probably be on top of the list. 7. Of course there are other important factors which should be considered such as recyclability, temperature tolerance and safety. Sustainability with become increasingly important as more and more battery systems are installed. Plus recyclability will over time become a major issue. This topic is covered in detail towards the end of this review. The Tesla Powerwall 2 with 13.5kWh of 'usable' storage capacity is an AC battery as it comes with an integrated 5kW DC-AC inverter/charger. AC batteries can be fitted to home with existing solar installations which can make installation simpler, but still requires a solar inverter to function with a solar array, plus the additional Tesla gateway box is required to enable backup power. See the full specifications, life cycle, warranty and costing details here. LG Chem offer a much larger range of RESU (Residential Energy Storage Unit) batteries in various sizes from 3.3kWh up to 9.8kWh in two voltage options, 48V and 400V. 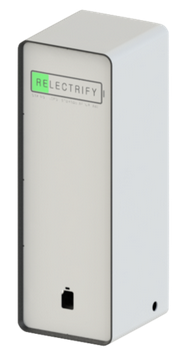 Previously just the single 6.4kWh RESU6.4EX lithium battery was available. The latest 48V range includes RESU3.3, RESU6.5 and RESU10 units with an option to combine different units using an adapter for up to 19.6kWh of total storage. BYD is the largest Chinese manufacturer of rechargeable lithium batteries and has dominated the Chinese electric vehicle and energy storage market for some time, however BYD is still relatively new to both Australia and north America. BYD manufacture a wide range of lithium energy storage systems for both commercial and residential applications using LFP or Lithium Ferro Phosphate cells which are considered the safest and most stable battery chemistry. The Pylon Technology lithium iron phosphate (LiFePO4 or LFP) batteries were some of the first modular lithium based batteries available which enclosed both the lithium cells and battery management/control system in a simple rack mounted unit. Available in 2.4kWh modules allows easy setup together with connections for multiple units in parallel. Now also available in high voltage modules for commercial applications. Simpliphi Power is a US based battery manufacturer which has been a leading developer of Lithium-ion batteries since 2002. Initially developed for durable remote military and mobile power systems the Simpliphi PHI batteries are well known for their extremely high cycle life, safety and stability. ZHEJIANG Narada Power Source Co. is a Chinese based company primarily focused on power system and energy storage solutions. The REXC series Lead-Carbon based battery technology uses a nano carbon material with high capacitance and highly conductivity on the negative electrode. The company claims this combines the advantages of both lead acid batteries and super capacitors to enable faster recharge. BAE Gel Secura batteries are high quality German made lead-acid based batteries designed specifically for off-grid and hybrid installations. The BAE Gel Secura PVV battery uses an advanced tubular-plate electrode with woven polyester gauntlet and solid grids in a corrosion-resistant lead-calcium alloy. The fully sealed maintenance free battery design utilizes the VRLA technology and have been proven to perform in harsh conditions and elevated temperatures. Sonnen is the leading Germany lithium battery manufacturer and is the largest residential lithium battery system company in Europe. Until recently Sonnen had deployed the largest amount of home battery systems globally surpassing Tesla and LG. The SonnenBatterie ECO range is much like the Tesla Powerwall 2 in that it is an AC battery with built in DC-AC inverter but it still requires an additional solar inverter to function with a solar array. * Estimated capacity loss values shown are based on several criteria including manufacturers performance data detailed in each battery section, active or passive cooling, cell chemistry and discharge rate. High grade cyclindrical Lithium Ferro Phosphate (LFP) batteries are known to have the most stable chemistry, greatest temperature tolerance and longest life of all batteries however they are also the most expensive. LFP batteries also contain no Cobalt and are considered the safest and most sustainable lithium battery chemistry. # I have used 70% as a hypothetical cut off point where individual battery cells may not be holding charge and 'tripping out' under higher discharge rates. Battery cells may still be functional but BMS, sensors, electronic control systems can also become degraded or fail over time. ITP Renewables battery test centre results charts - Image credit ITP renewables. ITP Renewables in Canberra Australia have been running battery performance tests at the Canberra Institute of Technology since 2016. The tests are performed in a climate controlled environment to simulate real world conditions in an accelerated manner. The tests have had some very interesting results over the years but due to some issues with hardware and monitoring the early results were not 100% reliable. The centre is testing many of the worlds leading stationary battery systems including several of the batteries in this review. The results are published every 6 months and will be vital to determining the life and performance of various home energy storage batteries in simulated real world conditions. We look forward to the next set of results published. See the latest ITP battery test center results here. The newly included BYD B-box now comes in as the best value based purely on cost per kWh, although the price reduction from LG chem means the cost difference is minimal over a 10 year period (see graph below). The recent price increases from Tesla push the Powerwall 2 above LG and other brands, although the Powerwall is still the only battery with a liquid cooling system in addition to the built in battery inverter. (1) Estimated capacity loss based on 1 cycle per day - 80% DOD for Lithium, 30% DOD for Lead-acid. Including battery efficiency factor - Round trip efficiency of the battery during charging and discharging in which some energy is lost. Note: Simpliphi and Sonnen LFP battery estimated life greater than 15 years according manufacturers specific operating criteria - see battery life chart. Beyond 10 years the SimpliPhi PHI and Sonnen ECO systems will no doubt out last the competition due to the longer life LFP chemistry backed up by industry leading warranties. Generally LFP chemistry, if managed correctly, will result in lower capacity loss and longer life so long as charge/discharge rates are maintained as specified. The BYD and PylonTech LFP batteries are expected to have a greater loss of capacity over time due to very high discharge/charge rates allowed which can accelerate degradation. It is important to note there are several assumptions used and true performance in real world conditions may vary. Also this comparison is focused on smaller capacity (hybrid) systems used for residential applications of less than 20kWh capacity. For larger capacity and off-grid applications lead-acid deep cycle batteries would be much more competitive. The Tesla Powerwall 2 includes a 5kW battery inverter/charger and is still good value for money but it doesn't incorporate a solar inverter or back-up capability so like the other battery systems additional equipment will be required which adds to the installation cost. The Powerwall 2 is the only system to incorporate a liquid cooling system which may prove to prolong battery life over time. 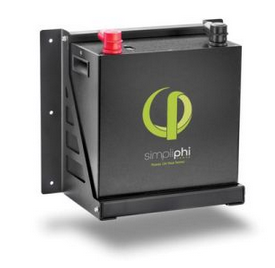 The SimpliPhi PHI battery range may have a higher up-front cost but due to the very high efficiency, low rate of degradation and range of battery sizes to choose from ends up as one of the best options, especially if considering upgrading an older lead-acid battery system to lithium batteries. Continuous power output of the lithium batteries can be limited as highlighted in the above chart, although in some cases multiple battery modules can be linked together in parallel to provide greater power output. Unlike Tesla and LG the SimpliPhi and BYD batteries are fully scalable and not limited in this way. However for most residential applications the 5kW continuous output of the Tesla and LG batteries is more than adequate. Generally for higher capacity (above 20kWh) and high power output systems above 5kW then SimpliPhi, BYD lithium options or the lead-acid (BAE), Narada, or any of the other well known lead-acid manufacturer would be the best option. The Sonnen ECO range is rather limited when it comes to power output as the maximum is 2.5kW continuous output due to the fixed inverter size. * Tesla and Sonnen efficiency values include inverter losses AC-DC-AC (charge and discharge). ** Estimated based on various charge/discharge rates - Typical discharge duration of 2 hrs for Lithium NMC & LFP, 10 hrs for VRLA (Narada & BAE). The round trip efficiency is the charging and discharging efficiency or losses during use. Unfortunately due to the laws of physics the transfer of energy from one form to another results in some losses and in the case of lead-acid this is normally as high as 20%. The newer high density Lithium batteries can achieve extremely high efficiency with as low as 2% losses, which over time means the performance and return on investment is much better for lithium system. Besides the cost per kWh figure there are many important factors to consider when selecting a battery storage system such as compatibility with the hybrid or off-grid inverter and adaptability with your existing solar setup (if installed). The Powerwall 2 and Sonnen ECO being AC coupled batteries are very flexible and can be added to most new or existing solar systems however the communications are not compatible with most solar inverters and separate monitoring systems are generally required. In contrast the LG chem RESU batteries being DC coupled are compatible with almost all well known hybrid and high-end interactive/off-grid inverters so this gives much greater system flexibility. LG chem RESU 48V batteries are compatible with almost all the leading solar hybrid & off-grid inverter brands. The list now includes Selectronic, Solax, Sungrow, Schneider Electric, Ingeteam, GoodWe, Redback and Victron Energy. The BYD B-Box Pro is also compatible with a growing range of hybrid and off-grid inverters including Victron, SMA, Solax, Selectronic and Goodwe. Note that some hybrid and off-grid inverters are optimised for charging lead-acid batteries and some lack the compatible communications to charge/monitor a lithium battery management system (BMS). This is where the SimpliPhi 'non managed' replacement lithium is a real bonus as long as the battery inverter/charger settings can be adjusted to suit a lithium battery. There are also many all-in-one systems with built-in battery storage such as Alpha ESS, Solax-Box, and TrinaBESS systems. LG batteries are one of the lightest and most compact coming in at close to half the size and weight of the Powerwall, and the new range are able to be expanded up to 19.6kWh capacity. If a smaller system is required and space is an issue then either the SimpliPhi, LG chem or Pylon Tech batteries would be the best option. Whilst lithium batteries seem to be the most cost effective solution and excellent for most hybrid grid-connected applications if you are setting up an off-grid system then high quality sealed gel lead-acid or lead-carbon batteries are still one of the most trusted options. Lead-acid batteries are a well proven technology and still advancing, in most cases with a correctly designed system you can expect a life of 10-15 years. The US manufactured SimpliPhi PHI and Australian GenZ and LiFe lithium LFP batteries are some of the only 'drop in' replacement lithium batteries which can operate with the leading off-grid inverters. These unique scalable battery modules are able to be easy linked up to provide adequate storage capacity or continuous/peak power output for larger off-grid system from 10 to 200kWh. The Tesla Powerwall 2 and Sonnenbatterie ECO AC battery systems are not designed for off-grid use as the in-built (transformerless) inverters are not capable of handling very high surge loads and do not incorporate any back-up (black-start) features, also the warranties will not cover off-grid use. From our knowledge the LG chem RESU, SimpliPhi PHI and GenZ LFP are the only lithium batteries certified for off-grid installations when used with the high end Selectronic SP PRO off-grid/hybrid inverter. For more information see our technical guide to selecting an off-grid or hybrid inverter. For information about designing a solar powered home refer to the building off-grid guide on our other site. You don't have to build an 'earth ship' made from recycled materials to have a solar powered off-grid home. Although looking at the newer housing developments we definitely need more unconventional and intelligent/passive home designs. How much does it cost to go off-grid? To learn more about selecting an off-grid or hybrid solar system for your home and the costs involved see our guide to selecting a home solar battery system. With an ever increasing number of battery installations around the world comes the inevitable problem of recycling the batteries once they have reached the end of their usable life. In the case of lead-acid based batteries this is not an issue as the infrastructure and recycling collection centres are already in place in most countries, enabling the Lead, plastic and electrolyte to be extracted and recycled relatively easily. In fact approximately 96% of all lead-acid batteries are recycled. The Aquion Sodium-ion (salt water) battery system is possibly the only battery which has been designed with sustainability in mind. With a unique non-toxic chemistry they are the first battery manufacturer to have met all the stringent criteria to obtain cradle-to-cradle certification for sustainability. Also since Aquion batteries are manufactured using abundant materials they are not be likely to suffer any material shortages due to high demand. Lithium batteries on the other hand are more difficult to recycle with some manufacturers not yet capable of 100% recycling the lithium cells. However there have been several breakthroughs in recent months by independent groups which are developing advanced recycling techniques specifically for complex lithium based batteries. American Manganese Inc is one of the many new companies developing lithium battery recycling facilities around the world. There are also some unique battery recycling methods being developed to simply extract the compounds (battery elements) to be manufactured into new batteries. Of all the lithium battery chemistries available the Lithium Ferro or Iron phosphate (LFP) batteries are the least toxic as they do not contain Cobalt. LFP batteries are also considered the safest chemistry with the longest life and lowest risk of thermal runaway if damaged or overheated. In the case of electric vehicles the Australian startup Relectrify has developed a clever way to extent the life of EV batteries by re-assembling them into a stationary unit for use in homes and businesses. Since most EV batteries still have a retained capacity of 60% or more at the end of life, this will give a new life to old lithium batteries for an additional decade or more extended use. Since most large lithium batteries are still in use there is no real push on recycling until the batteries reach their end of life over the next 5-10 years. The recycling difficulties lie in the complex lithium chemistries being manufactured of which there are several variations. Some cells are in powder form, others coated onto metal foil, all of which must be separated. At present the safest Lithium combination is lithium iron phosphate (LiFePO4 or LFP for short) which is one of the lithium batteries which can be more easily recycled. Lithium cells are also much smaller and often incorporate electronic management systems and thermal sensors which will also need to be disassembled. There is still abundant quantities of lithium minerals available but it is a finite resource so this will lead to greater incentives to develop more ways to recycle lithium batteries as the raw material cost will no doubt rise as demand increases.